Directions to 11821 Gravelly Lake Dr SW Lakewood, WA: Gravelly Lake Dr SW to home 11821 Gravelly Lake Dr SW. Follow driveway down to the detached garage, road takes a sharp right, stay to the right, home is beyond brick home on the left. 11821 Gravelly Lake Dr SW is a home for sale in the gravelly lake neighborhood which includes 5 Beds, 5 Baths, 7,064 sq.ft. of living space, 0.69 acres of land, and was built in 1915. It was listed on 01-18-2019	and has been on the market cumulatively for 71 days. The list price of $1,795,000 is 291.53% higher than the median listed price of $458,456 for other real estate for sale in Lakewood. 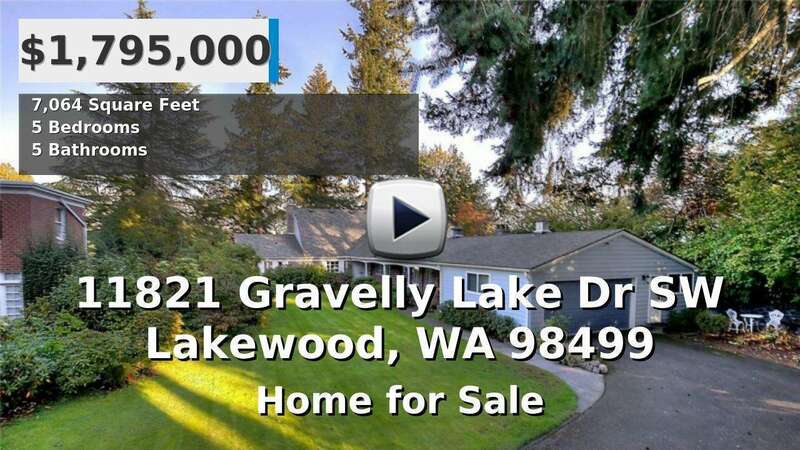 11821 Gravelly Lake Dr SW is also listed at 451.27% higher than median price of sold real estate of $325,613 in Lakewood. The price per square foot is $254.11 which is 34.14% higher when compared to the average price per square foot of Lakewood at $189.44. Want to see more real estate for sale? Search our available homes, condos, vacant land and rentals in Pierce County and Lakewood	.